Birthdays are a big deal around here. With Andy’s being only two days before mine, we like to treat ourselves to an extended birthday week where anything goes and we generally spoil each other rotten. We’ve celebrated on the island of Moorea in Tahiti, with a two-week road trip of the Pacific Northwest and Canada, on Maui and in Yosemite. If all had gone to plan, we would have been in Italy for a three-week birthday trip as I type this. Unfortunately, Andy is still struggling with his eye and the effects of the radiation, and it just wasn’t in the cards. So perhaps Italy will be a birthday trip to celebrate the big 3-1 instead. Better late than never, right? Instead, we are planning to play it by ear and take advantage of the many near-by possibilities. Living in the Bay Area gives you plenty of options for day trips: wine-tasting, restaurants, beaches, mountains, hustle and bustle, or peace and quiet. The possibilities are endless…now it’s just a matter of choosing. One thing we do know is that we have nine days of relaxation, no obligations, and each other’s company. I can think of worse things. One thing I do not do on my birthday anymore is go out to bars. It’s just too crazy, too crowded, and too drunken. I’d rather not have to jockey for a bar stool and deal with all the rowdiness…does that mean I’m getting old?? Being on an island that sees Cinco de Mayo as any other day is fine by me. So since we’ll be home this year, I predict that we will stay in, open a bottle of wine from the “good shelf” and eat some great food. Since it is Cinco de Mayo, a certain theme just begs to be followed, and since we are both huge Mexican food fans, that is not a problem for us. Andy’s all-time favorite meal is the chicken tostada salad from a little Mexican restaurant in Santa Barbara. It’s the only thing he ever orders when we go, and he truly adores it. So in honor of Andy’s birthday, I wanted to make chicken tostadas. These are nothing like the tostada that he gets at Playa Azul, but he was quite taken by them all the same. If eating was like poker, I’d be able to call Andy’s bluff every time. He has a tell when he really likes something…it’s a big widening of the eyes followed by a little smirk and almost always some sort of wimpery “mmmmm” noise. If I get the wide eyes, I know the dish is a winner. This one definitely got the wide eyes. And they happen to make a perfect Cinco de Mayo appetizer, or bocadito, to be enjoyed with a margarita, cerveza, or more likely for us, that bottle of good wine. Whatever you serve them with, they are sure to be a hit. In a flat dish, combine the chili powder, cayenne, cumin, coriander and salt. Pound the chicken breast out to an even thickness. Coat the chicken with a thin layer of canola oil, then press the chicken into the spice mixture, coating it heavily on both sides. Grill the chicken breast until cooked through. When cool enough to handle, shred chicken into very small pieces, stirring to combine with spice crust and reserve. Turn the grill up to high heat and coat the garlic, poblano and jalapeno peppers in canola oil. Place on the grill (raw garlic side down) and allow the garlic to soften and peppers to blister and char. Remove from grill and place peppers in a bowl, then cover with saran wrap to allow skin to steam off. When cool enough to handle, remove the blackened skin from the peppers and chop finely. Press the garlic cloves out of their skins and chop finely. In a small bowl, add chopped peppers, 1 tablespoon chopped garlic, tomatoes, black beans, and corn. Stir in juice of half a lime and salt to taste. Put cilantro, mayonnaise, white wine vinegar and juice of half a lime into a mini food processor. Run until smooth. To assemble, top each fried tortilla with salsa, chicken, then a drizzle of cilantro cream sauce. Time for wide eyes! These tostaditos are spicy, flavorful, and just damn good. Without any one piece, the dish wouldn’t work nearly as well. All the components combine to create an ideal bite. The creamy cilantro drizzle cools down the roasted peppers and spice of the chicken perfectly. I know one thing…we won’t be waiting for Cinco de Mayo to have these again. Before you go…today, May 2, please stop by the bake sale at Baking and Cooking, A Tale of Two Loves. Becky is raising money for the American Cancer Society and walking in the Relay for Life. This is an easy way to support an important cause, plus you get goodies for doing it! We all know someone who has been affected by cancer, and anything we can do to help raise money against it is helpful. Becky is hoping to raise $1000, so go now…bid on some of those yummy treats! Happy early birthday! Also, your photos are gorgeous! Great photos Karen! These tostadas look DELISH!! Happy Birthday, Karen! Your tostadas look soo good, and perfect for Cinco de Mayo. Thank you so much for the shout out. I appreciate it so much! I hope that Andy's eye is better soon. These look so good, but those corn tortillas look homemade...did I miss the recipe? Happy birthday! I love Mexican food but don't go out and celebrate Cinco de Mayo either. This looks like a great way to just honor the occasion at home though. I especially love the creamy cilantro sauce. Wow. That looks wicked good! Perfect for Cinco de mayo!! These tostadas sound really good...love that drizzle! Your photos are also beautiful! Happy Birthday!!!! You guys sure know how to celebrate. I have never tasted tostadas and now I am dying to try them; they look Fantasetic! These look gorgeous! Have a great Cinco de Mayo and welcome to your 30's - it's the best decade (OK I'm biased but...)! Happy Birthday Karen! Those look amazing and the cilantro drizzle is calling my name. NICE! Great looking tostadas! Very spoily-birthday worthy, I think :) Bookmarked! Happy early birthday! Those tostaditos look amazing. And oh my gosh... those bungalows. I need to go there RIGHT NOW. What's the name of the place in Moorea? Wonderful photos. The tostaditos look incredibly good. Happy Birthday Karen. May all your wishes come true ... what beautiful photos.Your Chicken Tostaditos look amazing ... a nice wine to go with it and whatever were you thinking about dining out when you get this at home! I am wild with envy at your wonderful birthday trips! I know you can't do one this year, but maybe a low key, spontaneous birthday around your area will be just as good. I wouldn't mind celebrating with some of these tostaditos. I would probably DROWN it in the cilantro cream instead of just drizzling it. Isn't is AWESOME to have a birthday on a holiday???? 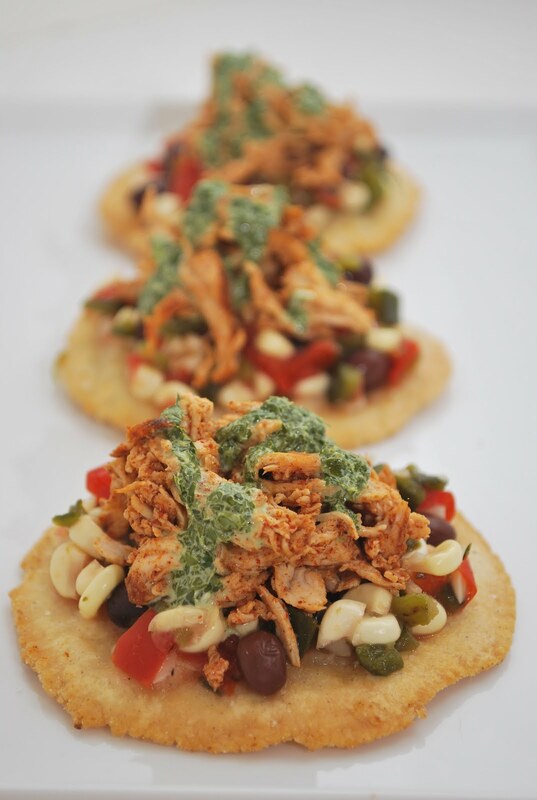 These tostadas look amazing, and I am loving the cilantro drizzle!! I will be hitting the big 3-0 next year!! Do it up right, girl! LOVE all your pictures... makes me want to go to each place. STAT! Happy birthday to both of you! Your photos are lovely, the tostaditos are also lovely....great looking all around! Best wishes for Andy's continued healing/recovery and a happy birthday! Happy 30th Birthday Karen! I didn't know you live in the Bay Area (me too). I hope you have a wonderful birthday at your local spot. :-) Your travel plan sounds fantastic. Now with the 2 small kids, it's impossible to go to all these places. Enjoy while you can! ;-) Your tostaditos looks amazingly delicious! BEAUTIFUL pictures Karen!!!!! Happy Birthday to you both and it sounds like your plans this year are perfect! These look so super good I can not control myself...I love all the Mexican I am seeing this week! Feliz cumpleanos! Your toastadas look great! I love a good thick tortilla. Will you share your homemade tortilla recipe? Happy bday!!! sorry there is no trip this year, but wow have you created a fiesta!! love the tostadas!! Yum...these look and sound delish. Happy birthday to you and hubby! Have you eaten at ad hoc in Napa? That would be a wonderful place for a celebration...not too horribly expensive, wonderful food, and great wine list!! Is there any way you could share your recipe for homemade tortillas? These look delish and I want to make them for Memorial Day! @Jenny - Here's my recipe for tortillas... Makes 8 regular size or 16 mini: Combine 1 cup maseca, 1/4 teaspoon salt and 1/2 cup plus 2 (or more as needed) tablespoons of water. Mix well. Form into balls and press on tortilla press. Cook tortillas on each side in a hot, dry pan. Use soft or fry to desired crispness.